(i) What are the benefits of inheritance in Java programming? Ans:- One of the key benefits of inheritance is to minimise the amount of duplicate code in an application by sharing common code amongst several subclasses. Where equivalent code exists in two related classes, the hierarchy can usually be refactored to move the common code up to a mutual superclass. This also tends to result in a better organisation of code and smaller, simpler compilation units. Inheritance can also make application code more flexible to change because classes that inherit from a common superclass can be used interchangeably. If the return type of a method is superclass Example, then the application can be adapted to return any class that is descended from Example. (ii) What are the applications of super and this keyword? The this keyword followed by a dot is used to access members variables and methods of the current object. There are two uses of the super keyword. i. It is used for calling the superclass constructor. ii. It is used to access those members of superclass that are hidden by the member of subclass. The super keyword followed by a dot is used to access the original version of the method from the subclass. The super keyword can be handy if you want to access the original method in the superclass that has not been overwritten in your subclass. When a constructor is defined in any subclass, it needs to initialize its superclass variables. A subclass can call a constructor method defined by its superclass by use of following form of super (parameter_list). Parameters needed by the superclass constructor are passed in super (parameter_list). The super keyword helps in conflict resolution in subclasses in the situation of "when members name in superclass is the same as members name in a subclass, and the members of the superclass is to be called in subclass". super.member; // The member may be either member function, or member data. (iii) What is the use of the final modifier? The final Modifier may be applied to a class, indicating the class may not be extended (subclassed). The final Modifier may be applied to a method, indicating the method may not be overridden in any subclass. final means it cannot be. (i) What is the input and output to a Java compiler? (ii) What is the relationship between java and HTML? Java isn't a page description language like HTML. It's a programming language. Description languages specify content and placement; programming languages describe a process for generating a result. Where there is generally a direct mapping between an HTML description of a document and the result, the relationship between a Java program and its result is likely to be more complex. It's a little like the difference between a list of square roots of numbers from zero to 10 and a program to calculate the list. The <APPLET> tag specifies the class to load (the CODE= field), URL information (the CODEBASE= field) and the size of the region the applet will own. Notice that Java doesn't exactly integrate with the rest of the page. Within that region of the page Java is king: it decides background color and fonts and does all the mouse and keyboard handling. Parameters to the applet are placed in <PARAM> tags between the <APPLET> and </APPLET> tags. Anything else between these tags is ignored. (iii) What is the import statement for ? The import keyword makes one class or all classes in a package visible in the current Java source file. Imported classes can be referened without the use of fully−qualified class names. multiple packages contain classes of the same name. (iv) what are the differences between application and applets? How do you run an application and an applet? 1. applets can be embedded in HTML pages and downloaded over the internet, or Intranet. 2. Applets can only be executed inside a Java-compatible container, such as a modern Web Browser. 3. Applets execute under strict security limitations that disallow certain operations, such as accessing files or systems servies on the user's computer. 4. Applets are the programs written specially for distribution over a network. These programs contain information to be delivered to the world and involve user interaction, for example, order entry form, registration form mailing, etc. 1. Applications have no special support in HTML for embedding or downloading. 2. Applications can be executed from the command line with a small booting utility such as javac.exe or java.exe. 3. Applications have no inherent security restrictions. 4. Applications are system level programs i.e., these programs run in the background and don't involve user interaction, for example, server administration, security manager, etc. 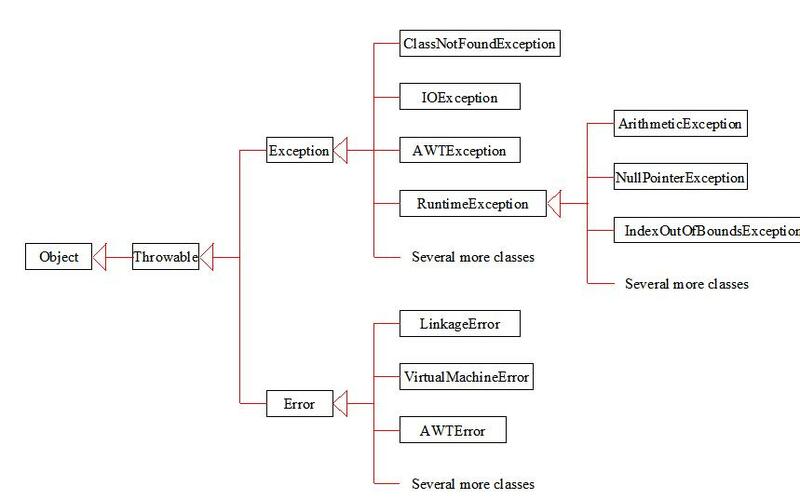 (i) Describe the JAVA throughable class hierarchy and types of exceptions. Raised when a variable is used without initialization. Raised when a number is divided by zero. Raised when an array element which does not exist is accessed. Raised when a specified class file is not found. Raised when attemptiong to access a string element which does not exist is attempted to be accessed. Deals with file related errors. (ii) What is the purpose of claiming exceptions? The purpose of claiming exceptions is to tell the Java runtime system what can go wrong. You claim an exception using the throws keyword in the method declaration. You can claim multiple exceptions, separated by commas. To claim an exception in a method, use the throws keyword. (iii) What is the keyword throw and throws used for? The keyword to claim an exception is throws and the keyword to throw is exception in throw. The throw keyword is used to raise an exception. call stack until it is caught by an appropriate catch block. it throws using a throws modifier on the method declaration. The throws keyword may be applied to a method to indicate the method raises particular types of exceptions. · The throws keyword takes a comma−separated list of java.lang.Throwables as an argument. Design a menu-driven interactive programme to find out capital cities of all the states of India using switch statement. Given the marks in the three subjects, write a programme to process the applications to list the eligible candidate. Q. 6 Write a programme to perform binary operations on integer argument. The arguments and operators should be accepted using command line parameters. I convey get backlinks during the office all of the time. I really like get backlinks!. © 2007 - 2009 HamidRaza - Today, there have been 10 visitors (84 hits) on this page!